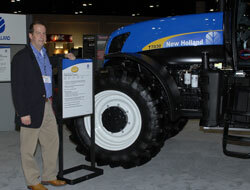 The New Holland director of marketing and brand development is Steve Gorsuch. He’s here at Commodity Classic and I caught up to him in the trade show this morning. He says that the theme of their dealer meeting last month was “True Blue.” It was meant as a statement of who they are and their commitment to their customers and the industry. He also talks about their new decals and logo and says it’s meant to show their long legacy, strength and history of the company.